Inside front cover is for Batman Arkahm Asylum, such a good game. Gamma Base, New Mexico. Not long ago. This story takes place during the events of Hulk 4, 5 and 6, as per Proper Placement Paniccia’s editor note. A harem of Harpies are seeking out the Hulk. San Francisco. Iceman and Angel are having a cup of coffee and catching up. On the Golden State Bride, Red Hulk punches Hulk off of the bridge as Thor watches on. Graymalkin Industries. New Headquarters of the X-Men. One Hour later. With how nice Beast is being to Cyclops, this is prior to Utopia, which also makes since as they are not on Utopia. That’s Kitty on the right side of the page, right? Comicbookdb suspects so, that’s why I bought the issue. The costume is generic enough to be her’s. Above the Cuckoos and below Darwin and whoever that blonde guy is. Storm is not responsible for the latest thunderstorm. There is a report that a mutant is responsible but Cerebra isn’t detecting the threat. Cyclops is worried about losing the public support of their newly adopted city. That has to be Kitty, right? Running along with Colossus? comicbookdb states it is her but Marvel Database doesn’t list her, but they don’t list like three other people either. I get that Marvel Database wants to be certain but I am on comicbookdb’s side on this issue. The X-Men go around and start saving folks. Emma senses rage coming from the Golden State Bridge and Wolverine smells a familiar scent. 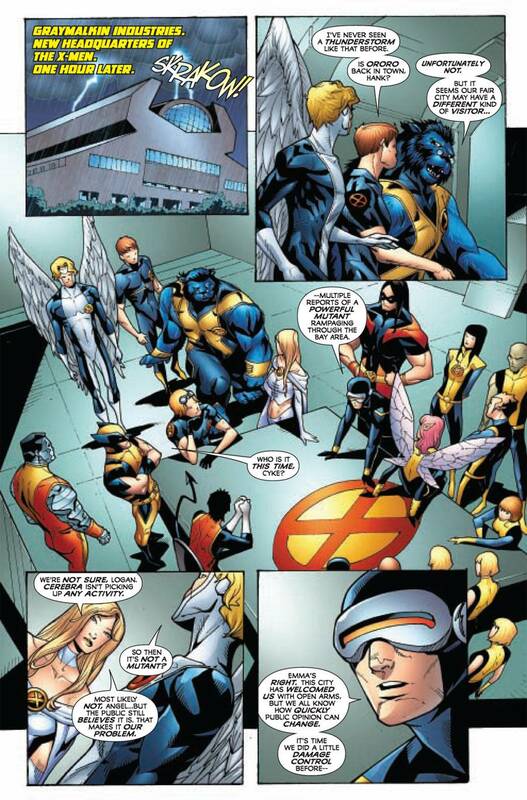 Cyclops sends Angel and Iceman to investigate. The two of them come across the Hulk. Angel references how the Hulk is an old friend of the X-Men, Past-Tense Paniccia tells us to see the clasic Hulk Annual 7. Hulk goes back to fighting Red Hulk. Monument Valley, Arizona. Soon . . . For some odd reason, Angel and Iceman are going to a state over and seeking out the Hulk. They follow some giant foot prints but come across a second pair of foot prints. 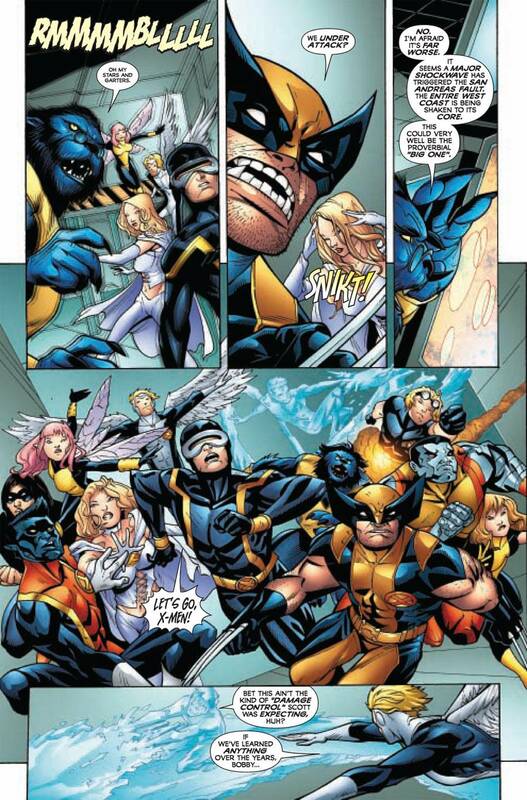 Angel wants to split up but Iceman doesn’t, he wants to stick together and follow the small of the two sets. Bruce Banner is walking about the desert and at this point, I feel like there was a crucial page that is missing. The Harpies attack Bruce and he turns into the Hulk. My only experience with the Harpies is that Betty Ross was turned into a Harpy, once. There is a double page ad for the Honda Insight, so go buy one of those. The Hulk is taken back to Gamma Base, where he was created. The harpies start attacking him, he sees a vision of Betty and stops. Iceman freezes one of them, Hulk asks if he froze Betty, Bobby says he did before he realizes that he said what he said. So he now has an angry Hulk to deal with. They try to remind him that they are friendly but silly Iceman hurt ‘Betty.’ Apparently in Hulk Annual 7, they fought robots together, thanks Master Mark. So they use that to describe these Betty robots. Hulk starts ripping harpy faces off. There is a double page ad for Ultimate Alliance 2, it could have been better. For those who might need this tip, Angel’s therapist has this to say – physical activity is a healthy way to work out aggression. So take that advice if you are so willing. Iceman isn’t sure what this desert fight as to do with the city on the bay and I’m not sure what even got them to come here. Cyclops shouted their names, and they said on it. I guess they followed Hulk here but that is a long way to track someone. The two original X-Men get into the fighting harpy battle. One of the harpies slices Iceman into two and Angel loses his mind for a tad and turns into Archangel. Why he wastes time as Angel, is beyond me. I get that he is super aggressive as Archangel but that isn’t too bad. Archangel makes very short work of the harpies. Hulk mistakes Archangel as a harpy and is about to smash him with a rock. That’s pretty clever, Mr. Sumerak. Angel tells him that the big birdie is deep within him, and he hates it. Hulk can relate as he hates what is inside of him, Puny Banner. Speaking of colors, Hulk tells them that Red Hulk is bad Hulk. 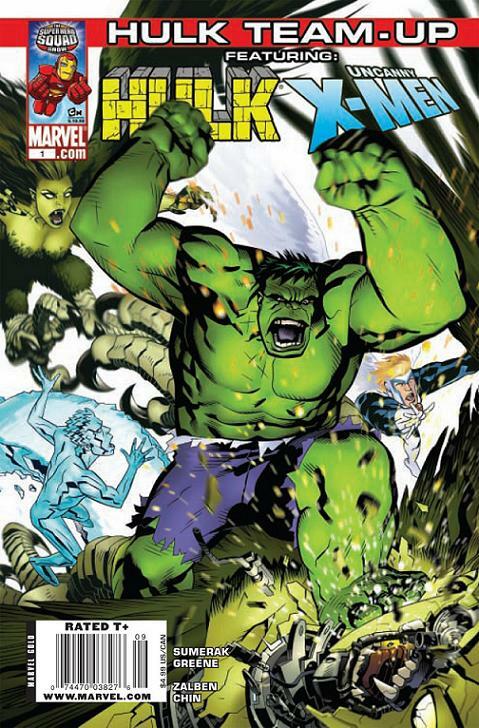 Issue ends with Hulk returning to look for Red Hulk and the two X-Men going back to their new home. An odd little story, that I’m not sure what the point of it is, except to get the X-Men and Hulk into a comic without messing up either one’s stories. There is a Savage Hulk v Hulk pin up and an additional story starring Dazzler and Hulk that doesn’t reference X-Men Unlimited 32, which is disappointing. The final page promotes Incredible Hulk 602, Hulk 15, Son of Hulk 15 and Incredible Hercules 134. So I guess this was Marvel’s way of letting us X-Men know that there are a slew of Hulks and we might find one we like. But like Hulk’s response to Bobby’s comment about how there are more than one Hulk out there, only one matters. Back cover ad is for the Kia Soul.